Yaykaas is our fourth malamute. He is our Swedish import from kennel Cahppes 22.11.2009. Yaykaas's official name is Cahppes Trapped Under ice and his calling name Yaykaas is from old Alaskan native language, Athna Athabascan and means Flaming sky / Aurora Borealis. 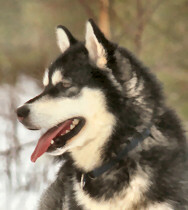 Yaykaas's pedigree includes many working mals, like his father Nokke (BISs *C.I.B. SE UCH NO UCH FIN UCH NORD JV -07 NO W -09 Cahppes Chikuminuk), which have accomplished working tests PolarhundProv 1, Polarhundtest D (100km) and Polardistans (170km). Nokke is also succeeded in shows, he is year 2009 Specialty Winner in Sweden, under judge Nancy Russel from kennel Storm Kloud. 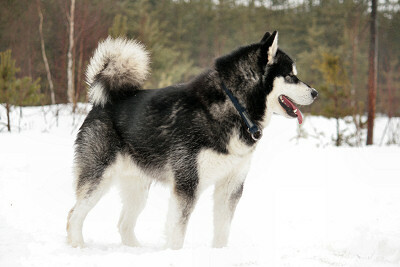 Nokke's sire is S(Polar)CH Noatak's Bearclaw Courage Du Breeze and dam SUCH NUCH FINUCH NORDUCH NORDV-07 Silent Ridge Canadian-Candy, who also has accomplished PolarhundProv1-test. In Yaykaas's lines are also N TCH S(POLAR)CH Noatak's Kotzebue Uwanga Breeze, INT&NORDUCH KBHV-03 NORDV-02 NORDV-03 NORDV-06 SUCH Terrapin's Talisman Polartrax and SV-04 Nanook Spirit I'M Hotshot Too. Yaykaas's mom Draga (Draga Od Mamutì Skály) is also working in Cahppes team and has accomplished Polarhundprov1-test. In Draga's pedigree are many interesting malamutes like CSSPCH INTUCH PLCH SICH Just Fur Fun Shamanrock, ESCH USCH Storm Kloud's Legend Continues, CSSPCH INTUCH PLCH Believe The Win Montego and still at the age 14 years active and healthy Alysheba Shamanrock. Yaykaas has excellent proportions, strong bones and topline. He has also balanced angulations, strong paws and good coat. Yaykaas is excellent mover with strong drive. Front is slightly straight and his head in still under development. Yaykaas is very energetic, smart, friendly but little bit shy. He is very promising working dog, strong and motivated. He has been in leader's position in our team from his first time in harness. Yaykaas works as a team member but also all by himself. Because of his young age, he has only one official working result, REK2. In weight pull Yaykaas has pull 280 kg / 9,33 x own weight on snow and 844 kg / 29,2 x own weight in cart. First official weight pull test title KVK1, he got from Ohkola Weight pull Test 26.1.2013. From dog shows he has gained Finnish Champion-title. At his only Puppy show he was BOB-puppy and also Group-3. 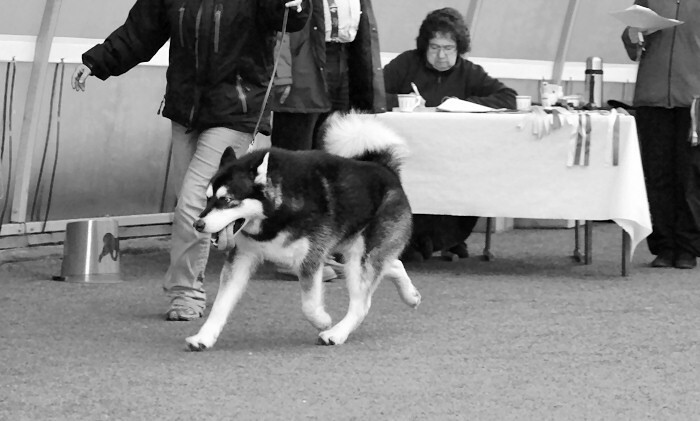 In malamute specialty 2010, he was baby-class (5-7 mo) best male puppy, Puppy competition class he was placed 2nd. Thank you Anci ja Henrik for this lovely malamute!